I've built a scaled-down editor app that illustrates a lot of what makes JavaFX awesome for building client GUI applications. 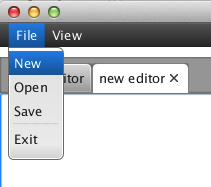 Recently, I've been building a specialized file editor with JavaFX 2.x for my day job. While I can't share all the details of that project here, I can share the key findings I've made along the way. I've built a scaled-down editor app that illustrates a lot of what makes JavaFX awesome for building client GUI applications. In fact, despite all my work with JavaFX over the past 2+ years, there are many features I've just never worked with closely. Let's take a look at three of these features now: the TabPane, MenuBar, and FileChooser interfaces. In the second part, we'll explore keyboard processing, the WebView component, and the file editor itself. I've never created a multi-tabbed interface with JavaFX. It's not that I avoided it for any particular reason, it's just that I never had a reason to until recently. With JavaFX, it took me all of five minutes to learn what I needed. Here's a summary with some code. The end result is a simple set of tabs in your application UI, as shown here. Next, let's examine another common navigation tool: menus. Believe it or not, I've never needed to create application menus with JavaFX until recently. All of my work with JavaFX has been building custom JavaFX controls to be integrated into an existing Java Swing application; hence no need for menus. Again, it took only a matter of minutes to learn the API and build the menu system my application needed. Here's how. Below is the complete menu and tab code in the beginnings of the simple JavaFX file editor application. In the next part, we'll fill in the remaining details of the application, and I'll present all of the code.